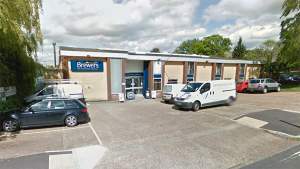 Our branch on Brickfield Lane in Chandler’s Ford has been supplying painter decorators, contractors and homeowners with essential paints and decorating materials for more than 40 years. We’re sometimes called Brewers Decorator Centre Eastleigh, too. We have a large unit filled with all sorts of trade and designer paints, we perform paint mixing on site and, because we have particular expertise in protective coatings, you can source all of your specialist paints from us too. You can also request a site visit, so we can assess product requirements based on an actual inspection. When you visit, you’ll also find wallpaper books with hundreds of the latest designs to browse through. We’re based on Chandler’s Ford Industrial Estate, the same estate as Peter Green – that well-known furniture store. Brickfield Lane is directly off Bournemouth Road, and you’ll find us diagonally opposite Plumb Center and directly opposite Tendercut. There’s lots of parking outside and the store is fully wheelchair-accessible. Head north-east on Bournemouth Roads and take the left turning onto Brickfield Lane, the store is located on the right. Head north-east on School Lane, turn right down Brickfield Lane. Follow this road and the store is located on the left. Head south-west on School Lane, turn left down Brickfield Lane. Follow this road and the store is located on the left.